For fashionistas and those who have a penchant for the world of style, the name Emporio Armani certainly evokes a sense of respect, as this house of fashion has certainly done its bit to suit up the rich and the famous for so many decades. 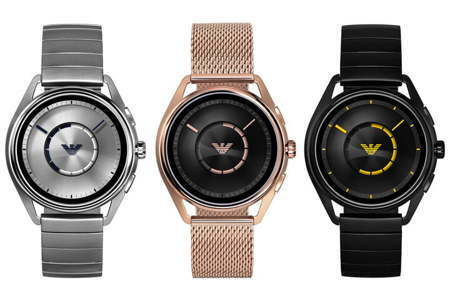 Rather than just rely on cloth and thread alone, Emporio Armani has also moved on with the times, working on a smartwatch that will certainly go down well with their collection of suits and dresses. This is not the first smartwatch from Emporio Armani, and it certainly does not look as though it will be the last. Unlike its predecessor, it has a totally new visual direction accompanied by an adequate amount of technology underneath the hood. Known as the 2018 Emporio Armani Connected watch, the one drawback would be the use of the Qualcomm Snapdragon 2100 platform that has aged well, but considering the premium brand name attached to it, it would have been better if some newer hardware was thrown into the mix at its core. The introduction of a heart rate sensor located right on the back of the case is new, allowing fitness enthusiasts to be able to track themselves while working out. In addition, a GPS chip within is also another interesting addition, stepping in when your smartphone begins to run low on juice, while NFC technology would open up the world of Google Pay for you. Fret not when it begins to rain, as the body itself is also water resistant all the way to accommodate a swim, which is something that a smartwatch with a premium brand name attached to it hardly boasts of. Overall, people would purchase the 2018 Emporio Armani Connected simply because of its understated yet stylish design, with a stainless steel case that arrives in silver, gold, grey, or black shades and a choice of either a mono link bracelet, a Milanese loop, or a leather strap. With the first model retailing for $395 a pop, this bad boy should cost approximately the same when it arrives.